I am simply a sucker for the variable colorations in the glaze that are the serendipitous result of the clay surface interacting with the environment of the wood-fired kiln. Isn’t it just beautiful? This little tea-time treasure, by my fellow League of New Hampshire Craftmen clay artisan, Becca Van Fleet, is simply a gem. Becca has been making some really incredible plates with stone motifs, but revealed that this mug is one of her first attempts at something floral. For me, I have a strong impression of crowberries, which is a happy coincidence (echoing my Alaskan fiber art business, Crowberry Craftworks). And I just love having an early example of an artist’s work… it makes the piece all that more valuable to me. Aside from all these things, though, what makes Becca’s mug my favorite, is that I feel like I can sense the spirit of the maker within the thing itself. And that is the magic of handmade, that sense of the the individual in the object, the imprint of the maker. In her artist’s statement, Becca declares, “If you enjoy your morning coffee just a bit more because you had it in one of my mugs, I’m doing my job…. 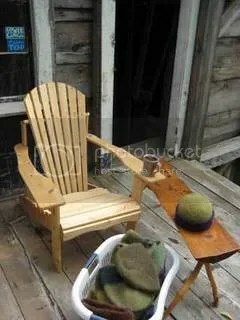 And if you have begun to discover the subtle ways that using handmade objects can enhance your daily life, I’m really doing my job. “Thanks, Becca, for loving what you do and making such beautiful pottery. It matters. Your work brings beauty and warmth into my day! 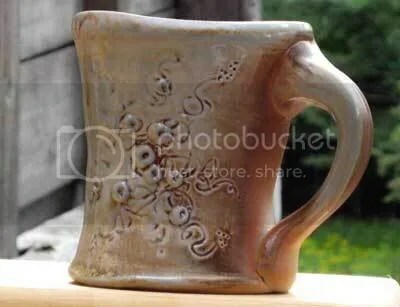 This entry was posted in Fine Craft, Life and tagged beautiful, Becca Van Fleet, Fine Craft, lnhc, mug, pottery, wood-fired by Carrie Cahill Mulligan. Bookmark the permalink.